If there wasn't a bobbin change, colour change or yarn change, then it was time to move the temple. That happened every inch or so! It was rather busy for a simple design. After a while you do develop a routine and it quickly adds up. I decided to cut off the first blanket as one of the 8/4 doubled cotton dividers was pretty darn tight on the loom. I retied on and got things under way again and there was no further difficulties with cranky cotton. The cloth beam filled up nicely... a bonus with chunky yarns! I wove the second planned blanket and took a serious look at what was left for warp. I decided to forge on and see if I could get a small little blanket for a car seat or ? It meant no samples for my records but that's okay at a time like this. The bonus third blanket was woven in plain weave only and no extra colour other than the beige cotton weft. It was only 7 inches shorter than the other two full crib sized blankets! I must have been very generous with my calculations on warp length! I used every inch I could squeak out.... see below! That's the back of my warp and the ruler is right up against the heddles on the sixth shaft with only an inch and a half to spare! Once off the loom I carefully serged the edges with the threads set closer together to protect the cut edge better. The little tufts still came through! Then I sewed a straight stitch through the serged stitch! I also ran a straight stitch a quarter of an inch in from the selvedges to ensure that the weft changes stayed put through the numerous washings to come. I found these little clips a couple of years ago in the quilters section at the local fabric store and they sure are handy. I was able to position and use them to hold the slippery satin in place. I was able to replace them with long straight pins for the final trip to the sewing machine. Not sure what happened with the lighting in this shot but you can see that sewing is under way and I'm using a stitched zig zag and took it slowly. Here's the binding after sewing.... and below is after a pressing! I decided to go with a beige binding as the purples and green bindings would be too much 'in your face' with the bold colours. It might be nice to use bolder colours for babies but I went with what felt right for me. I had tried machine sewing one end closed and butting it up against the fabric but it would always shift and never sit just right no matter how many clips and pins I used. So I opted for leaving the ends open and then doing a fold and press near the end and folding the ends like an envelope and pressing and pinning. 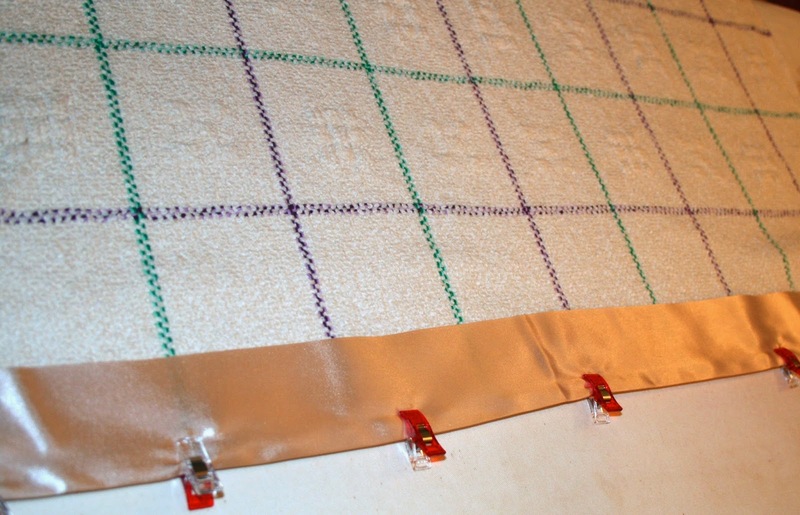 Later after zig zagging, I would hand sew the ends closed with very tiny stitches that actually nearly disappeared into the satin weave. There were two blankets woven with the windows and lace. The final dimensions are 29 inches by 60 inches and 29 inches by 53 inches on the second. The larger one is for the new baby. 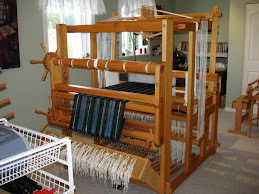 The dimensions on the loom was 34 inches in the reed and woven to 64 inches and 58 inches on the second. That's a lot of take up and shrinkage! I had pre-washed the warp yarn to try and prevent some of the inevitable. It was funny trying to dunk the skeins under water as they floated like marshmallows and later, even being spun out in the washing machine, they still took 4 days to dry! I tried different lighting effects to show the lace. This grouping shows the bonus blanket that I wove in plain weave. It turned out rather nice too! It measured 29 inches by 53 inches too. A friend has bought this one for her cuddly lap throw for TV viewing the chilly winter nights to come. The bear is Spike and he's mine. He's handmade by a friend from German mohair. Eileen made hundreds, all by hand and one by one when she was in business. All the blankets had tags added, but for one of them I wish it said "made with love by Nana"
While I'm scheduled for a new knee, I'm also in need of a new hip too. Next week I'll know if which joint is best to do first and we'll go with that. The hip is complaining louder but we'll have to see what the x-rays show and the surgeon recommends. I have medical appointments lined up all through out November for just about everything you can possibly think of from a root canal this Tuesday to a mammogram and everything in between! I do have another project in mind but its in mid-wind on the warping board. All natural silks and 36 epi. Meanwhile, my loom is Naked! Thanks for your patience as its going long between posts now. Weaving and spending time in my studio is what is keeping me sane right now and so I'll be weaving when ever I can. 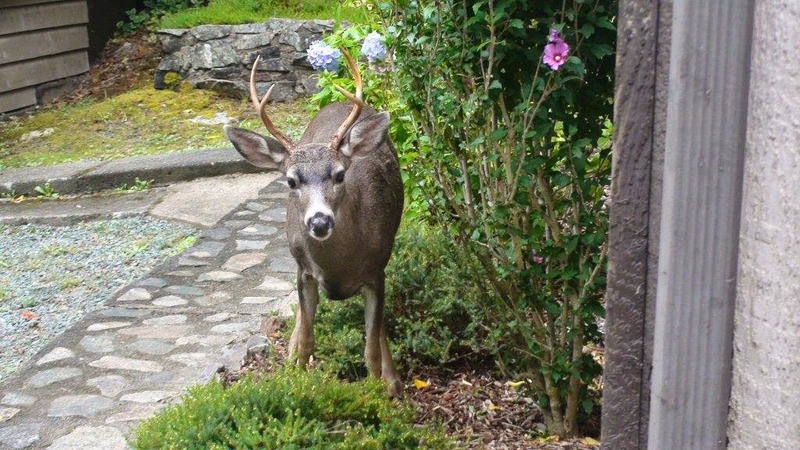 Isn't he handsome with his new antlers? Bruce was sitting at his desk when he heard banging on the house. Something told him to take a camera with him and the picture above was the first he snapped. The buck was hitting the house with his antlers. 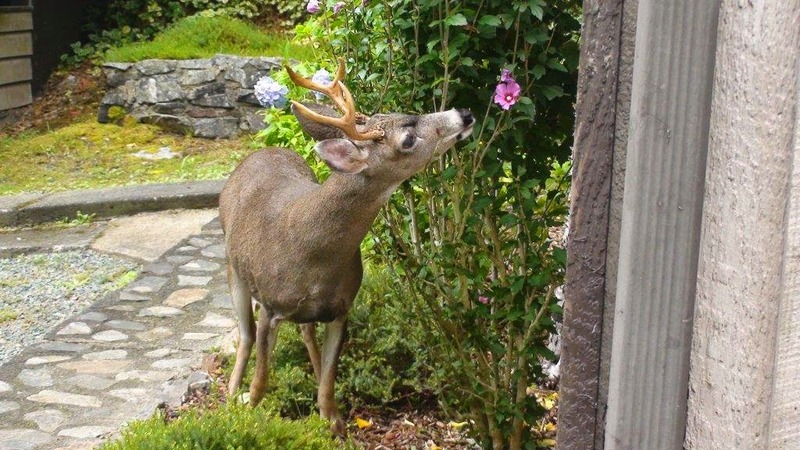 But not the last shot as this fellow decided that Bruce was not a threat and went back to eating fallen peaches off our tree that's against the house. Then he made his way to where the wife and kid are. Note the cedars, artfully shaped by the deer of course. 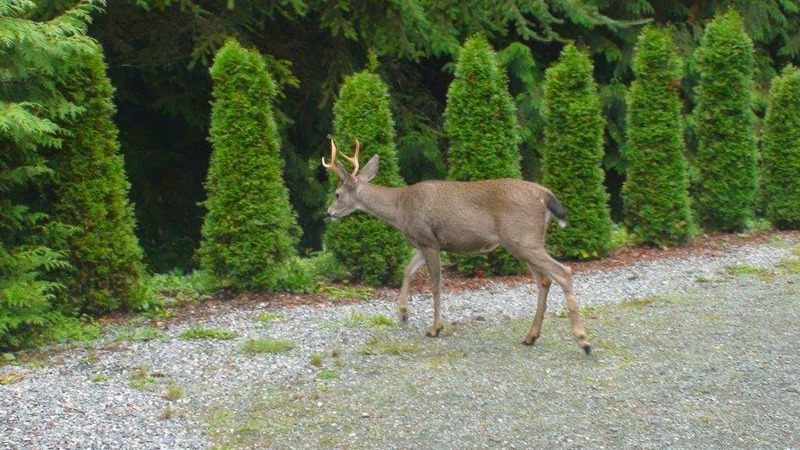 This buck has been living on our property for three or four years now after his mother was hit by a car. We seem to have a bumper crop of pears this year! Bruce picked these and we are enjoying their aroma in the kitchen while we wait for them to soften up a bit. Bruce also spotted a muskrat swimming up the creek today and he watched it for a time doing some 'personal grooming' at the creekside. I'm sorry I missed seeing that one! 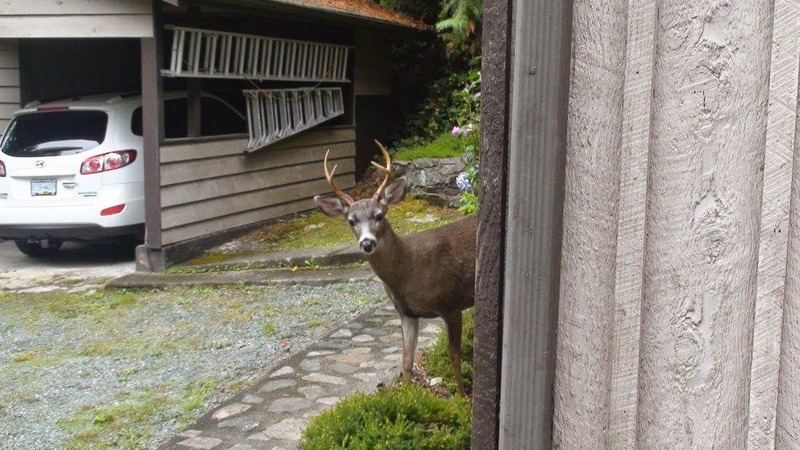 It seems that the local wildlife know this is a safe place to visit... and I like that.